My sister is the best at making salads; she loves using different vegetables and herbs, often adds fruits and nuts and always comes with up the best dressings. Her salads have bold, but not overpowering, flavours and always look so damn pretty! She’s visiting in a couple of weeks and I’ve been testing different dishes I want to make for her. 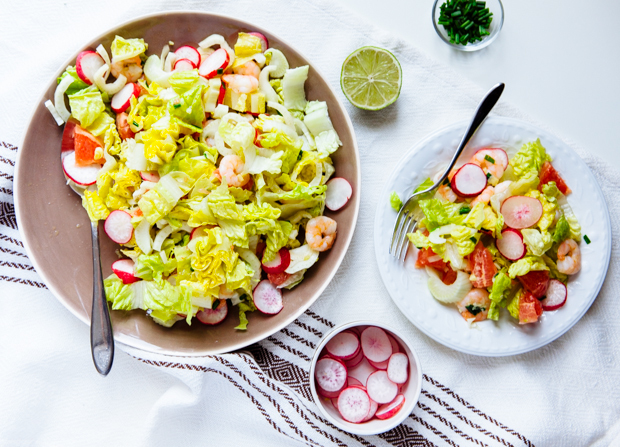 This salad is very much influenced by the ones she makes: equally delicious and pretty, it combining different textures, colours and savoury and sweet flavours. 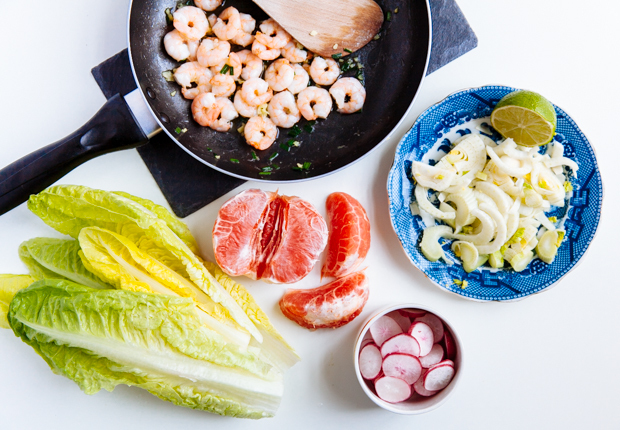 Crunchy and mild lettuce leaves are paired with peppery radishes and crisp, refreshing and strong-flavoured fennel; pink grapefruit slices add an extra pop of colour and a delicious bittersweetness, as do the prawns, lightly sautéed with fresh ginger and chives. Finish everything off with a very light dressing of olive oil, lime juice and just a touch of honey and you’re ready to go! Even though salad days are not here just yet (I still crave big bowls of bold-flavoured soups), this one has definitely made me anticipate spring and the light dishes that come with it, almost as much as I anticipate having my little sis here. Get here, already! Make the dressing: segment the grapefruit over a small bowl, catching any juices. Set the grapefruit slices aside and add the rest of the dressing ingredients to the bowl, whisking quickly. Heat one tablespoon olive oil in a small pan over medium heat; add the prawns, ginger and chives and cook until fragrant and juicy- about 8 minutes. Set aside and let cool slightly. 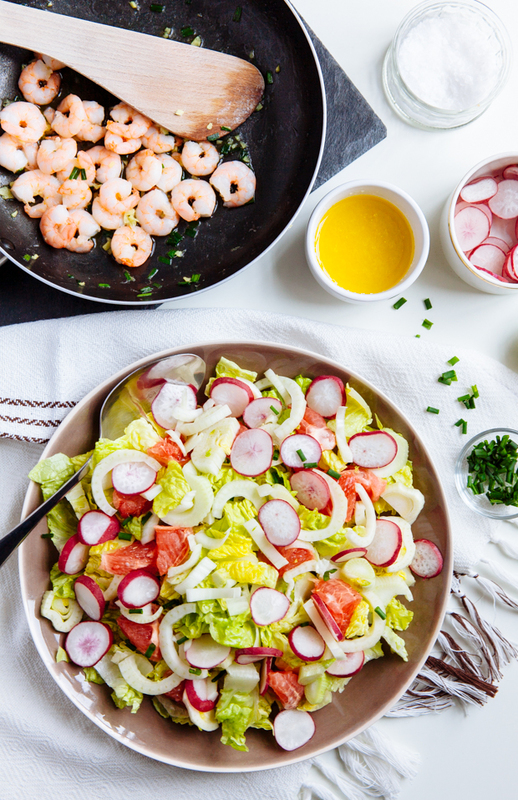 Place the lettuce and fennel slices in a large serving plate (or bowl); on top, arrange the radish and grapefruit slices. 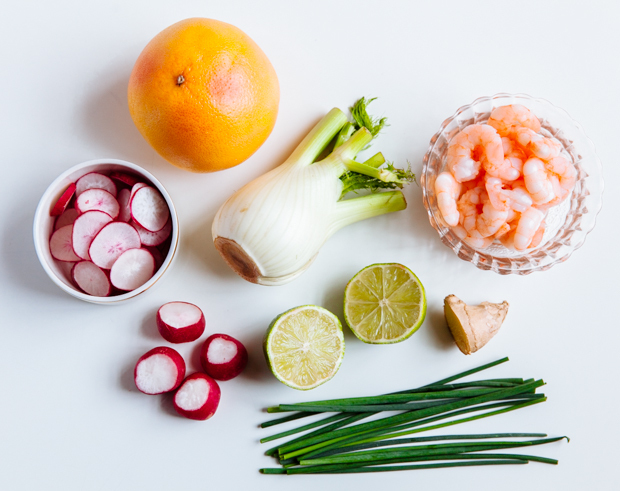 Add the cooked prawns, scraping the pan to gather any leftover pieces of ginger and chive. Dress the salad, toss, scatter some extra minced chives and adjust the seasoning to taste. I think it would be perfect, salad master. Send photos, please! Can we have a mother’s day menu please?